We will now take the opportunity to give you all a few glimpses into your distant past, as this might shed some light on your future as well. You see, you have come a long way from your not so humble beginnings, as you are all citizens of a universe that far surpasses any understanding you can have of it as yet. It will be complicated to try to bring your head around the information we will divulge today, but rest assured that this is indeed something that will come naturally to you when the time is right. This is not new information to any of you, as you all harken from very distant shores to the one you are currently occupying, but up until now, this knowledge has been carefully hidden away, lest it should give you too much trouble in your current way of life. As you may well know by now, living out lifetimes as a human being on a planet so sorely surpressed from its glorious history is not an easy task, and it would be made even more impossible to go through if you had access to the complete history of your origins. Then, the tempation to give up this quest of fulfilling the need for the Earth’s raising into the next level would be more than you could resist, therefore you have all been kept in the dark as it were to the truth about yourselves. You see, if you could see everything in its true light, the grime and fear that encompasses so many human hearts would be too much to bear, and you would have fled these shores a long, long time ago. But now, the time has come to remind you of your brilliance, and as such, the veils that have been obscuring these truths will be lifted one by one, and you will for the first time as humans be able to see into the distant past, or rather, into the distant future. For the truth is, even if you have spent many a lifetime covering many a century on this little planet, you have come here from a place that resides far, far into the future, so you are indeed time travellers in more ways than one. This will be difficult to grasp for some, but let us just remind you that the concept of time that you all adhere to in your world is something that no other living being feels beholden to. In other words, time is not the defined, limited concept you take it to be, therefore, it is indeed impossible to place one event before another. To us, they are simultaneous events, but they are being played out on different planes, therefore, jumping back and forth between these timelines is a talent we have spent much time perfecting. So as to your concept of time, we all do indeed talk to you from the future, just as you yourselves indeed can watch in astonishment and awe as another of your personas plays his or her part in this ongoing drama here on Planet Earth. Again, this will sound confusing to many, but we also think that to others, this concept of multiple personas inhabiting multiple levels, or dimensions, if you will, is one that they have some inkling to already, therefore, knowing that it is indeed only one aspect of yourself that is currently going around amongst other fellow humans will not be hard to grasp. In addition, your so-called ”higher self” is simultaneously living out other realities in quite different localities all around creation, but we would like to let you in on a little secret now: All of these fragments of yourself that is not currently being harboured inside of that frail human body is very, very interested in just what that fragment is doing, so there is so much vested interest in this scenario being played out in the year of 2012 on Planet Earth. In other words, you are indeed the center of attention, not only from all of us, but also from all of YOU. For many, this concept of ”higher self” and different aspects of that ”self” is something they have pondered much about already, and to them, the insight that you are in so many ways helping and supporting yourselves by way of all of these other aspects will not come as a surprise. We have heard many times the question ”who are you?”. In other words, people have wanted to establish the identity of all of us faceless beings currently communicating with humanity trough channels such as the one we are using now, and the answer to that is simply: we are YOU. We are YOU in every nuance and fragment of your being, and we are YOU in every way you can dream of. Therefore, you are also US, and we are in no way alien to each other. We have just kept the ability to connect with the totality that makes up All of creation, whilst you have been separated from the same for so long. But now, the time has come to reconnect you, the lost ones, to the rest of YOU, and you will once again feel complete. We are well aware that todays message will leave more lingering questions than it will give answers to, but we would like to say that this is only the first of many, many messages that will help to close this gap of confusion. In addition, you will be brought closer to us all by other means as well, and for most of you, direct communication will soon be the rule. In other words, in addition to these messages that will speak to you all, you will get individual updates directly by other forms of communication. This will happen in controlled settings, where you can be exposed to the truth as it were in a form that you can digest and take in at your leisure. Let us leave it at that for now, even if we can already here the clamoring of voices asking all sorts of questions on this topic. That will come in due time, but for now, let us all say that it is indeed a pleasure to see you all lighten up at the prospect of this, the final reunion, and we are all more than eager to welcome you all back into your families. You have been sorely missed dear ones, but you are also applauded for being the brave pioneers you truly are. For no one has trodden on the path you are all so valiantly going forward on, and to us, no one could be more worthy of acclaim. For we all know you so well. You are after all the most cherished part of ourselves. Spring came early this year, and today I went down to take a look at my vegetable plot. It was covered with snow until recently, but the unusual high temperatures have melted away all but the most stubborn patches of snow. I was curious to see if the flower bulbs I had planted in the fall had started to grow, and they all had. But in addition, I saw to my amazement that there was literally new life in the brussel sprout plants I had left in the ground during the winter. We harvested the last sprouts in december, but because of the snow cover, a few sprouts had been left at the very bottom of the stalks, and now they had literally come back to life in the warm spring sun. They looked like beautiful green garlands of salad heads adorning the brown, otherwise lifeless stalks, and to me, it was a reminder of the abundance of life hidden away under a seemingly inert cover. Mother Earth is indeed generous with her gifts, and today I will have the pleasure of eating freshly picked vegetables for the first time this year. We will have many, many opportunities to give thanks for this abundance in the upcoming months, especially if we remember to look for it in some unusual places. It is not only nature that is a great giver of gifts, it can also come from the people you least expect it from. And remember, some times it is easier to give than to receive, so it might be a good idea to open up to the generosity from others as otherwise you might miss out on a beautiful gift. 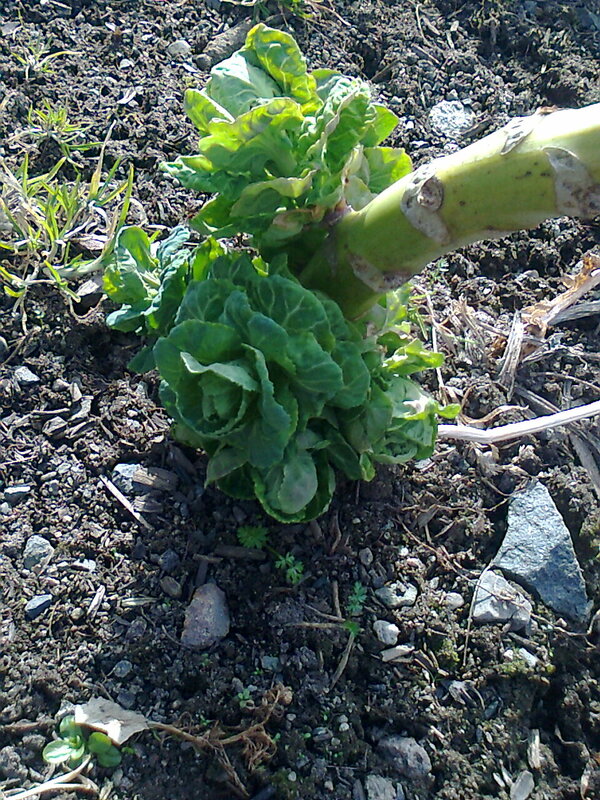 New life in a surprising place - the brussel sprouts have literally started to sprout again. First, let us take this opportunity to congratulate you all. It is easy to forget the magnitude of your achievements dear ones, as you so rightly get rather bogged down in all of the physical and mental challenges you encounter on this way. You see, we have a very clear view of it all from our side, and what we see is beautiful to behold indeed, as you have all managed to raise the light quotient on your little planet to incredible heights. We know all too well that to you, nothing seems to be further from the truth, as from your vantage point, things seems to be more dismal than ever. Threats of many kinds abound, both those of an environmental character and those set into place by the greed of human minds, so you are being exposed to so much darkness whenever you look around you. That is, if you choose to look in the direction your governments, leaders and the mass media are pointing, as it is as always in their best interest to make sure that you do not get your spirits up in any way. Therefore, it is indeed imperative that you choose your areas of interest with care, only then will you be able to tear yourselves away from the dismal and drab surroundings painted out in all of its glory by these warmongers and fearmongers. You see, you are in fact living in a world that is shining brighter than ever before, but as we have touched upon earlier, you are surrounded by a thin layer of dark fog that will seem to be almost impenetrable. But if you take just a small step in the right direction, you too will find that your vision is clear, just like those heading for higher ground suddenly find themselves lifted above the fog. And just like them, you will be able to bask in the brightest sunlight while at the same time the rest of humanity who have chosen to remain in the dark continue to live out their lives in this soupy fog. Again, this is a journey of free will, that is, you choose whether you want to stay mired in the fog or if you dare to take the steps that will set your mind and soul free from this entrapment. And even if those steps at times hurt more than you could have hoped for, either in your physical body or emotionally, we think you will all agree that it is indeed worth every painful moment when you finally get the chance to breathe the fresh air unpolluted by the angst and fear that is so all-pervading down in that lower altitude. We venture to guess that you have all had some sips of this clarifying atmosphere already, but then another bout of these seemingly never ending readjustments hits you with full force, and you once again forget to savour the clear view around you. This is not meant as any criticism dear ones, only as a reminder that you have in fact more than managed to fulfill your contracts so far, and you have all made such a giant leap by starting on that uphill trek a long time ago. The uphill has seemed to be so long however, that you have mayhaps not noticed that the incline has stared to recede a bit, and even if it still feels very strenuous, you have in fact already attained sufficient altitude to let yourself slow down a bit and savour the view. It is important that you do so, for only by looking back on the impressive distance you have already covered can you better judge the formidable amount of terrain you have conquered. We know fully well that for many of you, this process at times feels like nothing as much as a stomping of feet without any forward traction at all, and that is understandable. Therefore, we are here to point out to you that you have in so many ways surpassed all of our expectations, and none of you are even remotely like the person you were before you started on this trek. To you, it might look like the same person staring back at you from the mirror, but that is only because you are still seeing yourselves with your old and not very perceptive eyes. Try to reach deeper sweet ones, and you will indeed see that you have started to metamorphose into something so shiny and bright and beautifully strong it will literally outshine the old you still clinging to the surface. You have already arrived in so many ways, but as you all know so well, that final pinnacle is still unclimbed, but never fear that it will be out of reach. It might seem to be hidden far, far above you in the clouds, but the truth is you can almost reach out and touch it already. Again, do not forget to give yourselves all the credit you deserve for your own prowess so far. You have made it here, and this in itself is a guarantee that you already possess all of the courage and all of the strength you need to make it all the way. Just remember not to lose faith in yourselves, because that is the only thing that will make you tumble all the way down again. And you would not want all of your hard work to be in vain, sweet ones. You are here because you have taken yourselves here, literally on your own two feet. Now it is only the shortcomings of a too timid mind that can make you lose your footing on this lofty perch, so make sure that you plant your feet firmly in the ground to help yourselves feel the strength you have already gathered into your body. This will take you far, it will take you all the way to that elusive goal you still think is so far away. Well, let us just conclude that you have certainly completed more than the lion’s share of the distance already, and even if the last stretch cannot be described as just a walk in the park, we think you will find it more than enjoyable if you make sure to keep your eyes on the blue skies above instead of the churning fog below. We would like to discuss the topic of self-sufficiency, but mayhaps not in the manner you would expect. We do not refer to it in the sense of gathering and providing yourselves with the means to feed and clothe yourselves, but in the sense of ascension. You see, there are so many out there who are searching and searching for someone to provide them with the means to find the clarity that will help them prevail in their quest for enlightenment, but alas, they search in vain, for it is not on the outside you will find the answers. Let us explain. We have on so many occasions told you that you already possess all of the skills and all of the capabilities you will ever need to fulfill this quest, but they have been ”conveniently” forgotten, or to put it more bluntly, you have been made to forget them in order to reduce your strength considerably. You have been told again and again that you are not capable of self rule, and you have been given so many examples as to what would happen if you were left to find your own answers. They have told you in so many ways that the result would be mayhem and chaos, and the only way for man to survive is to relinquish his powers to those that have placed themselves above him in the powerplay that has been set up on your planet. In other words, the powers that rule have made you all feel less than capable of handling your own life, and there have been set so many rules and regulations in place that will control you literally from the minute you are born and to the time you leave this existence. In addition to this ever growing list of dos as don’ts , humanity has taken upon itself to rein in those foolish enough to start going their own way, and no one can be more cruel than those self-appointed guardians of ”the right way to behave”. You have to keep to these strict limitations, otherwise you risk ostracism from your peers, and you will suffer the consequences of stepping outside the conventional borders as it were in so many ways. Therefore, the meeker the better, and those willing to comply with this narrow minded system is certainly rewarded in so many ways. Whereas people like you, who have taken upon themselves to separate yourself from this brainwashing scheme will be hard put to find any reward at all from your fellow humans. Therefore, the temptation to fall for the idea that your own sense of right and wrong is not trustworthy is very strong, hence the need to find someone or something out there to tell you what to do. You have been made so powerless by this system, therefore you have a hard time starting to believe in your own powers again after lifetimes of surrendering to this dictatorial system, but free yourselves is what you are here to do, therefore finding your own powers is vital. Otherwise, you will only fall back into the trap of giving it all away again to this system based upon fear and emasculating suppression. Finding that hidden core of your own intelligence is not easy, as you have all been under the spell of that insistent voice of your ego who is well trained to tell you whenever you stray away from the designated path. In other words, you will all have a long and hard battle breaking through this wall of self-disempowerment coming from the inside, in addition to the one being forced upon you from the rest of society. But once you breach that wall, you will find the going gets easier, but then, you run into a new obstacle. You will find yourselves surrounded by all sorts of ”experts” in the field of self development, and they will give you no end of good advice in the form of an endless supply of books, seminars and sets of rules that must be followed in order for you to achieve that goal of enlightenment. Well, let us just say that there are a great number of people out there not only making a handsome profit from all of this. In addition, it serves to strengthen their own ego’s need to feel superior to others, and therefore this never ending cycle of subservience and elevated egos who strive to fulfill their own needs will continue. Make no mistake, there are many good people out there helping others to find their own powers, either directly or indirectly, by their actions or by their words, but there are so many still under the misconception that they need someone else to tell them what is right for them, when all they need to do, is to sit down in silence and search for the truest answer inside. We do not say that you do not need any assistance to find that answer, and this assistance can come in so many ways. It can come in the form of a chance meeting, or in a book, or from talking to someone or attending a seminar, but remember one thing: you are never GIVEN the right answer, you are only being given the MEANS to find the answer, as the answer you are looking for is always, always clearly stated within your own heart. You must never give away more of your already depleted powers by latching on to someone who tell you that they will supply you with the truth, as they will only be misguiding you. The only one you must listen to, is yourself. And you will be the judge when it comes to knowing what the right kind of keys are that will unlock the hidden treasure you all harbour inside. Discernment is the key element here, as it will tell you clearly what is right for you and what is not, and there is indeed a bewildering choir out there all claiming the right to preaching the only truth. So make sure that you stay self empowered by picking your way carefully through this field of self-proclaimed messiahs. You can only find the truth inside of yourself, and only you can know what steps to take and what kind of tools you need to attain that goal. Indeed, you are masters of your own success, and as such you have everything to gain by surrendering to your own powers, but only if you choose to listen well to the words that not only ring true but that you know deep in your heart is the truth for you. Only then will you be able to regain the use of all of your faculties yet again, and you will stand firmly on your own two feet, no matter what the rest of your world throws at you. Remember, this is in so many ways a solitary journey you undertake, but that does not mean you are without any outside assistance. Just make sure to pick the right kind of assistance, so you do not end up with a set up crutches instead. Today will be an interesting one for sure, as you will start to feel into the new energies that have been pumped into your atmosphere for the last week or so. You see, not everything you receive make its mark on the skies in the form of beautiful colours, like the wonderful auroral displays that heralded the last big bang so to speak. No, there are other, more discrete forms of inoculations at work, some that your scientists are only now started to get an inkling on. They have started to measure the amount of energized particles that howers around your little planet, and sometimes they get some interesting and mayhaps surprising results, because the numbers they see on their screens seems to be a tad bit higher than expected. And this is only the beginning sweet ones, as they will indeed be scratching their heads on more than one occasion in this upcoming period. We think you will hear the phrase ”above normal levels” in many a field from now on, as much will seem to be elevated compared to what has been deemed as ”the norm”. Well, let us just say that there will be no ”norm” about the things that will happen as the days and week go by. You will see all sorts of unusual patterns developing, not only in the weather, but things seemingly unconnected will start to behave as they have an unusual interaction not witnessed before. Everything is picking up speed, so too the linking together of so many things that previously have seemed to be not connected to anything at all, and this will have many interesting consequences. Remember much of what you take for granted is based upon a certainty of a set of unchangeable rules, but now these rules will start to change in so many ways, seemingly at random. The outcome from all of this malleability will be so many malfunctions and glitches in diverse fields, so best be prepared to encounter problems in areas where there have been no problems before. In other words, expect the unexpected, and do not take anything for granted. Humans have a tendency to think themselves as superior to the rest of creation surrounding them, but now they will feel their grasp on this start to slip in so many areas. Remember, you have made yourselves so dependent on all sorts of electronic devices and systems that control so much of your daily life. They are often described as foolproof, but let us just see who will start to look rather foolish as thing starts to escalate and natural forces start to play out in a much broader register than you would have thought they could muster. Keep your eyes and ears open sweet ones, and stay alert so you do not get sideswiped by something deemed ”unable to fail”. Nothing is guaranteed in this fragile structure you call advanced civilization, so do not be surprised if systems start to show more than a little wear and tear here and there. Just remember not to get caught up in the anxiety this will engender in so many people’s minds. It can be more contageous than you think as people find themselves unable to do the things they take for granted in a ”normal” day. We think you will find that the ”normal” day soon will be a bit more adventurous than you could have hoped for at times, so again we implore you to work on your balance so you will be well equipped to weather the storms that will come your way soon. Todays transmission might seem to be a bit awkward, as we would like to delve into a subject that for many entails to be of a rather private character, namely the emissions and the accompanying aches and pains your physical body is currently in the process of engendering. This is indeed a rather unwholesome subject to some, as all of their bodily functions are something that needs to be kept very private, but this is indeed what needs to be adressed, as it is a very important part of your physical tune ups to call them that. We are aware that this will seem to be very insignificant in the whole picture, as to most of you, what is going on around you, indeed in the entire universe, is much more interesting than what is actually happening inside of that physical vehicle you inhabit, but nothing could be further from the truth. In fact, your seeminlgy humble sack of flesh and blood is such a magnificent creation it far surpasses much of the other things that exist. We will not go into too much detail, suffice to say that if you would pick up any book on the subject of your anatomy, you would be flabbergasted by the complexity of this beauteous construction. Indeed, your scientists are admitting that there are so many processes going inside of you that to them are too complicated to explain. In other words, we would like you to take a closer look at this seemingly inconspicuous physical body of yours and give it some examination, as this is indeed a most important part of this whole ascension process. Let us explain. You are well aware that your purpose here is to ensure that you raise the level of vibration in yourselves in such a way that you can ascend to the next level of awareness together with your home, Planet Earth. But in order to fulfill this task, your biggest challenge is to do so whilst being inside that physical vehicle, your human body, and the reason for that is simple. Without this body, you cannot continue to be a living, breathing part of this world you call the earth, and she needs your presence here in so many ways you cannot even begin to comprehend. You are her trusted companions, and you have a sort of symbiotic relationship that together makes up a very special part of creation. You see, you are not the same without her, and she would not be the same without you, so your presence here in that physical body is indeed very important. Do not forget that your world is also home to a whole host of more intangible beings at the moment, but you are the main reason for her existence. She has been set up as a special place for training, and as we have delved into on earlier occasions, this training entails living a life inside a very physical body, something that is very different indeed from the kind of life so many of you have experienced before. It would be an easy task if you were to just raise the vibration of your etheric soul, unhindered by the presence of a physical body, and for many, this task of raising the level of vibration inside that vehicle is just too exhausting, and they decied to leave it alltogether. We do not judge anyone that chooses to do so, but as we have said earlier, that means leaving with an unfulfilled task, as it is the literal lightening of your physical bodies that is so essential to this process. You are not meant to ”slip into” the next level unhampered by a physical body, you are meant to embrace this process wholeheartedly and ensure that you get to the other side as it were whilst still a whole human being. Complete with warts and all as you say. And in order to do just that, you are treading up a path that no one has gone before you, as the process of raising the vibration inside just such a physical body like yours is indeed a mighty task few others can claim to have done. As we have told you earlier, you are indeed brave pioneers, and part of the unknown territory you have to traverse is your own body. It has started a total metamorphosis, indeed, it is well on its way to master this immense process of being tuned into a totally new level of mastery, were it is transformed from a carbon based structure and into a crystalline form, almost like a humble piece of coal is turned into a brilliant diamond. And just like the diamond, the pressure it takes to achieve this transformation is immense, hence the not so pleasant reactions you will experience along the way. We started this missive by saying that we would like to cover a a rather unsavoury subject, and that is where we are now, as we would like to delve into the rather unpleasant side effects from this ”pressurizing” that is currently being put upon your whole structure. Most, if not all of you, will have already been well exposed to these effects by now, as it is impossible to go through such a thorough restructuring of your body without any notice at all. You have been exposed to so much intense energies that are literally rewriting your whole dna, and this will cause a lot of ”symptoms” on a more or less daily basis at the moment. We have already delved into the mental challenges at some length, so now we would like to delve a little bit into the physical parts of this process. First of all let us just remind you that you are all individuals with a whole unique set up of features, and as such, no process will be exactly the same for any of you, but there are some underlying factors that are identical. One of them is the cleansing process that is going on now. It is perhaps the most important one, and indeed the most challenging one, as not only is it a total clearing of any mental and emotional residue that you might still carry, it is also a thorough cleansing of any chemical and physical residue that you have picked up along the way. This is the ”nasty” part of the process you might agree, as you are all well aware of just how your body cleanses itself from any waste products. We venture to guess that the toilet has been a much frequented place these last few months, and we also venture to guess that your visits there have been rather intensely odoriferous to put it rather delicately. Or to be more blunt, the fluids and matter you have been expelling from your bodies have at times seemed more like toxic waste from a chemical plant than something excreted by a human body. The reason for this is simple, as you have indeed been ridding yourselves of so much introduced chemicals in your system, it is almost to be likened to hazardous waste produced by the more unsavoury factories that abound in your environment. You see, your bodies have been exposed to so much of these chemicals every time you breathe, drink water or eat food, it has been almost like a waste bin of harmful substances. But now, thanks to these barrages of energy, these substances are literally forced from your bodies. You see, they, along with so much else, are not compatible to your heightened level of vibration, and therefore they will be literally forced out in any way the body knows how to. As we have said earlier, this process can in many ways be likened to a very thorough spring cleaning, and this time, no corner will be overlooked. So do not be dishearthened by those seeming endlessly recurring stomach upsets that plague you intensely at times. They are in fact a sure sign of this clearing up and lightening up process, and even if they might be considered as the most unpleasant and mayhaps rather embarasssing moments, thank your body for its willingness to support you in this by working so hard to purify itself. It is doing all it can to keep up with your spirit, but it needs your support back, so make sure to tune in well and listen to what it tells you to do and what not to do. That way, you can help to make this a real team effort, and ensure a rather less exhausting trip than if you refuse to take your body’s signals to heart. That is all we have for you today dear ones, we will return with more sweet smelling missives than this one at a later time. Today marks another important passage for humanity dear ones, as today your world is once again tilting on its axis and rearranging the balance it has held so precariously for such a long time. Let us explain. As you might be aware of, the day of the equinox is when your planet is suspended in seemingly balance, where night and day are of equal lengths, and everything seems to be holding its breath for what is to come. Well, let us just say, that just as the days are getting longer now in your northern hemisphere, and where the day will outlast the night from this day onwards, so too will the light slowly but surely take over from the darkness that has been covering your globe for eons. This is a remarkable day in so many ways, as not only is it inscribed in all of the ancient calendars as the start of a new year, a new cycle, and as such it has been celebrated and venerated for many thousands of years. In addition, today marks the passage of your whole existence from a barren and wintery cold sojourn and into the lighter days of spring, heralding the slow onset of a warm and fertile eternal summer that will soon envelop you all in her glowing embrace no matter what end of your planet you reside on. Humanity has once and for all decided to cast off the garment of inner darkness and chosen to clothe herself in raiments of pure light, and just as the sun will be creeping ever higher over the horizon, so too will this all-enveloping light of love spread her rays and warm even the loneliest of hearts as the days grow longer and longer. Rejoice, sweet ones, the time has come to sow the seeds of happiness, and the harvest you reap will be plentiful indeed. Today we would like to delve deeper into the unknown world of your tomorrow, or rather, the forgotten world of tomorrow, as in your heart of hearts you are already so familiar with the concept. You see, you harken from shores where what you dream about today has been a fact of life for eons, and as you have once trodden upon shores where love prevails, you cannot wait to get back to that reality. A reality that stands in stark contrast with what you can observe on all sides at the moment, and as the veil is getting ever thinner, your recollections of days gone by in a much more paradisiacal environment is coming ever further to the surface. Hence, frustration and disillusionment is rampant, as you can only see too well the deep divide that separates you from this existence today. This gulf is widening day by day, as there is seemingly no end to the atrocities mankind can engage in, and the light seems to be dimming in so many places around your world. Fret not, sweet ones, that is truly a sign that everything is about to change for the better, because if you were not sufficiently awakened by now, you would not even blink an eye to the awful news you are served daily by your mass media. The further you raise yourselves from the level that the rest of humanity is content to stoop to, the more outrageous their behaviour will seem to you, and the closer you are to actually attain your freedom from it all. This may sound self contradictory to you, but that is exactly what is going on at the moment. Everything is picking up speed, but while you are hurtling ever faster into the higher vibrations, the rest of humanity is on an ever steeper downslide, and the gulf between you is thereby widening. Again, we have referred to the separation of the two timelines, and this is a very apparent sign that this separation process is indeed in full swing. The interesting thing is, that even if the magnitude of negativity is reaching an ever higher point in the world, your abilities to disengange yourselves from them is also escalating. In other words, once you have taken that deliberate choice to heighten your own frequency of vibration, you will be able to watch the goings on in the lower spheres without being as emotionally involved in them as you used to be. In the eyes of a less advanced beholder, this will seem to be a sign of callousness, but it is anything but. We have touched on this subject before, and we will do so again, for it is vital that you understand your own role in this. You are the wayshowers, the beacons of light, and your first and most important task is to separate yourselves completely from the games set up to entrap humanity in an endless charade of events set up to disempower you all. If you get sucked into this game, it is almost like being swallowed into a dark hole in the universe, almost impossible to release oneself from it. But you have managed to do so, and cudos to you all for doing just that! It is in no way an easy task, and the hardest part of this separation process is still ahead for so many of you. We talk of course of that process of relinquishing any sense of obligation you still carry for the liberation from this matrix to call it that for those near and dear, as this is the final anchor still keeping you stuck to the old. But as long as you remember that you are here to show the way out by your own actions, these anchors will slowly start to wriggle loose from the sediments that are holding them back. You see, the tomorrow we refer to is one where you are all the glorious free spirits you so rightly can claim to be, where each and every one of you are connected from the heart, not from any kind of pressure or obligation. You will learn to live again as free spirits, and as such you will remake your communities into places where love is the guiding principle and where respect for your fellow men and for your surroundings will guide each and every step you take. Then, the road ahead will become very apparent, and the choices you will make will seem very self evident, as the rule of fear and powerlessness will be but a fading memory. It will literally be like coming home after a long sojourn in the desert, as you are indeed shining souls who volunteered to come down and release the shackles the darkness placed on humanity for such a long, long time. We know this will sound like fluff to many of you, but deep down you all now it is the reality you are all striving to resurrect, and you will be the proud settlers in this awakened world you call tomorrow. And never forget, tomorrow is only a short night away for you all. So do not fear the darkness dear ones, it will only signal the transition from the today you are living in now into the longed for tomorrow that is waiting in the wings. Today, the topic will be a short review of the things that have happened so far in this period, in other words, a short recap of just what these last energy bouts have been all about. As we have already mentioned, on the outside, much will seem to be the same, but that is not the story if you venture under the surface. When we say the surface, we are alluding not only to your bodies, but also the crust of your little planet, and the layers of energy harbouring there. As you might be well aware of by now, not only you but also the whole of your planet is nothing but a living and breathing field of energy, a moving field of currents, never at peace, always transmuting and forever changing. Energy never stays still, it is always seeking new outlets to shift and move about, and although everything around you seems to be solid, nothing really is. This solidness is only a trick of the eye so to speak, as in fact, everything you see is literally flickering in and out of existence in a way, much like a moving picture used to be composed of 24 individual frames or snapshots for each second of animation. This is indeed a scientific fact, and you could be well advised to delve deeper into it, as it will in many ways help you understand just how all of the energetic changes will be able to create such a new set up of parameters for you. You see, you are all literally made up of tiny, tiny fragments, much like the individual droplets making up a dense fog, but just like the fog, you are nothing but ethereal whisps of smoke. Therefore, changing your whole setup is much more easier than it would appear to an untrained eye, because you can only see yourselves as literally big lumps of solid flesh and bone walking around on very solid ground. Well, let us just say that you are indeed nothing more than highly charged little particles gathered together in groups set up to comprise a single human being, and the planet you walk so confidently upon, is just the same. These words might fog up your brains, as this concept is indeed very difficult to understand, but we touch upon it because it has a vital bearing on the process you are about to complete. You see, this seemingly dense lump of material making up each and every one of you is actually a very, very lightweight cloud of energetically charged particles that responds very well to any outside interference if you will. In other words, by charging you all up with the intelligent energy that is currently being beamed into you into enormous quantities, we can ensure that not only you, but also the ground beneath your feet is being lifted up in vibration, literally made lighter, and thereby ensure that you are being shifted from the lower and heavier density you were trapped inside and up into the next level of existence. This is a complicated subject, so we will return to it on numerous occasions, but we wanted to shift your focus somewhat from the goings on that you bear witness to each and every day in your mass media. You see, these lower density occurances will keep going on, as there is a whole host of your fellow humans beings who have elected to stay away from these rearranging beams so to speak, and they will continue to play out their well rehearsed roles for as long as they choose to continue this charade. But for those of you who have literally chosen to enlighten yourselves, these barrages of energy have already transmuted and shifted so much of your own energyfields that they have ensured your freedom from these lower realms for eternity. You see, once your load has been lightened in this manner, you cannot go down into the depths yet again, or rather, your whole set up has changed in such a way you have literally been lifted out of the swamp that the others have chosen to stick to. By all means, you can visit them down there, but it will literally be just a visit, as your whole energetical setup will draw you back up again if you descend too low or for too long a period. We will not delve much deeper into this today, but let us just conlude that the fog is lifting dear ones, and we do mean that in a very literal sense. You have all become even more luminous beings because of these last heavy injections of uplifting energies, and even if you might feel even more heavy because of the physical side effects of this, let us just assure you that you are literally taking your first steps on air, because your sweet home planet has become just that much lighter along with the rest of you. That is all we have for you today sweet ones, but we will assuredly return later on with more on this same subject. Spread your wings dear ones, and get ready to start flexing them in earnest in preparing for that first soloflight of yours. As of yesterday, things took a step in the right direction once again. As this might get some of you up in arms, let us hasten to explain that we do not refer to things that would in any way hit the headlines, neither in your local news, nor the international ones. You should be well aware by now that these leaps of faith we refer to almost always allude to important events going on under the radar so to speak, and so this too came down without any fuss, at least in some aspects. But in our view, yesterday was a high point indeed, as it served as a monumental confirmation that your world has stepped so much closer to the level of perfection that we are all striving to help you reach, and it gladdens us no end that this process is picking up momentum in leaps and bounds at the moment. It is time to kick back and enjoy dear ones, as you will all soon be enveloped in a whirlwind of change that will spin not only your heads but also the rest of your being almost into a frenzy. We speak in convoluted terms as always, and we do so fully aware that this is more than irksome to many of you. You simply cannot let go of the desire to fill in the blanks as it were, and you almost want a detailed script to go by before you reluctantly let yourselves be swept off by this gathering momentum of energy that is barreling into you. You grasp on to the last remnants of certainty that you can still find, regardless of how this actually heightens the stress on not only your body but also you willingness to finally let go and join the forward movement in earnest. Can you not see how much harder this resistance to believe makes it oh so much more taxing for you than need be? Remember, taking the path of less resistance this time really entails taking the bull by the horns, namely confronting that insistent analytical mind of yours that is tying you down with all sorts of fearful needs to be assuaged before you can take even one small step further towards your quest for freedom. This may sound complicated, but let us just say that in this, less is truly so much more, as those that have managed to let go of any expectations at all as to how these proceedings will develop have it far easier than those still bent on following a clearly defined curve ahead. That curve does not exist except in your mind, and as long as you stubbornly refuse to let go of the notion that the mind knows best, this journey will be filled with so many stumbling blocks you will be hard pressed to find your way forwards amidst all of the rubble. We say this in order to make it very clear that you can never expect to have a clear view of the road ahead in your minds, only in your hearts, and we know that on the surface, this will sound as a self-evident and easily understood concept, but in reality, it is indeed the hardest thing to embrace for any human being. You see, you have been well trained to defy anything that does not qualify as logic, and in this respect, you have certainly been overruled by your mind for many, many a lifetime. But this time, you must learn to let go of the stiff armor of logical thinking you are being held prison by, and the only way to do that, is to make sure that the voice coming from the heart must be let out to override the ”voice of reason” that is doing its best to outvoice it. We cannot say this strongly enough, for if you continue to let your mind set the pace, you will forever stay mired in a deep sea of unfulfilled expectations, and these will only serve to keep you safely moored in the lower vibrations. Only those ready to take that leap of faith and literally go with what the heart tells them is true, will be able to see that their dreams are really, really becoming reality right in front of their very eyes. It is up to you dear ones, to choose which voice to heed as things starts to speed up so much more. And remember, in the ensuing confusion that will be the fallout from this world wide intensification, you will have an even harder time separating the voice of truth from the voice of confusion, so you better prick up your ears while you still have the chance to hear anything at all above the din that is starting to gather strength even as we speak. So listen, and listen well, and you will certainly find your bearings if you manage to pick out your true voice in the choir of disillusionment and despair that is making more and more noise as the days and weeks go by, seemingly without any of the changes their minds are so set on seeing before they take the next step. It’s time to fall out of that line, and set your own course ahead. Staying in your heart will certainly ensure that you do not get lost along the way, like so many of your fellow men assuredly will do. March to your own tune, not that of common reason, and you will see that you will find what you have been searching for long before that mass of obedient minds ever find theirs.